New RFC with Holly and The Guy, The MFB, Mojomatic, Hasil Adkins and More on The AIR! 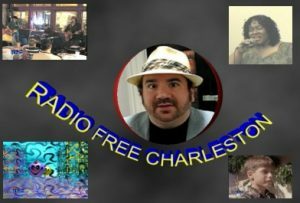 At 10 AM and 10 PM Radio Free Charleston brings the local music to you with a show that includes The MFB, Mojomatic, Hasil Adkins, Under Surveillance, Tofujitsu, Groove Heavy, Corporate Orange and more. At 3 PM The Swing Shift presents two more classic episodes because your PopCulteer and host has not quite recovered from coughing his voice into oblivion. 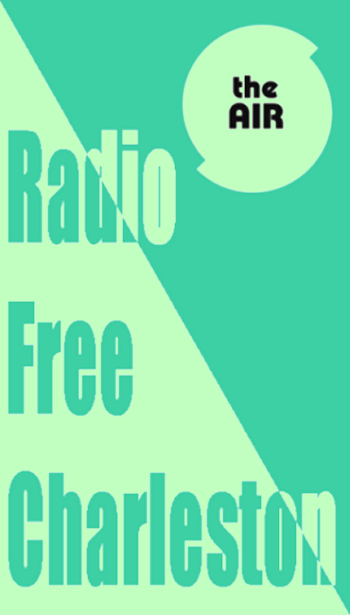 You can hear The Swing Shift every Tuesday at 3 PM, Wednesday at 7 AM, Thursday at 7 PM, Saturday at 9 AM and if you just can get enough, tune in Thursday at Midnight for a marathon of classic episodes, all night long. 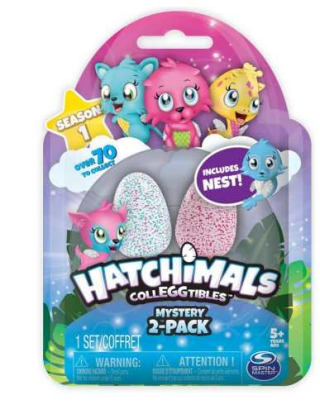 Toy Fair 2017: Spin Master-Hatchimals, Air Hogs, Meccano, Zoomer and More! 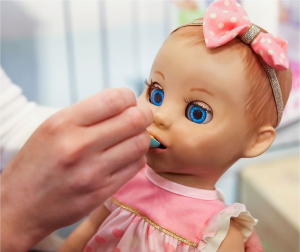 Dolls have been a favorite toy over the millennia for good reason: kids are instinctively drawn to play patterns evoking caring and loving behavior. With the introduction of Luvabella (seen right), Spin Master has seamlessly combined nurturing play with advanced robotics, bringing the classic baby doll into the 21st century. Luvabella affectionately responds to a child’s love, just like a real baby. Tickle her tummy or her toes and she will giggle in delight. Her beautiful expressive face is the first of its kind, leading to the most authentic movement and emotions. From her first word to Luvabella’s joyful giggles, every child will be mesmerized by all the moments to discover. Kids will love her every surprise! Recommended for ages three and up, with a MSRP $99.99 USD. 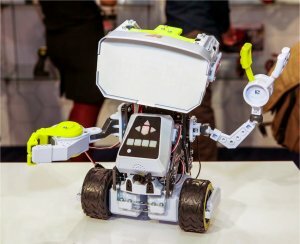 Spin Master acquired Meccano in 2013, bringing it new life and relevance, making Meccano the destination for creative kids with an interest in engineering and robotics. 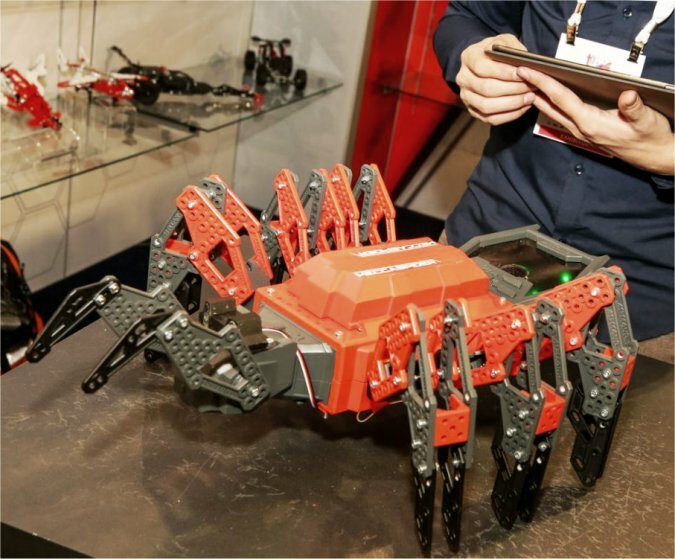 In addition to the building sets which have captivated children for more than a century, Meccano is set to launch the exciting Meccano M.A.X. Robot (seen right). Meccano M.A.X. Robot is the most advanced Meccano robot to date, drawing on advanced robotics technology that combines Artificial Intelligence (AI) learning and customizable programming to create a one of a kind personal assistant. Infrared (IR) Navigation and customizable apps bring M.A.X. to life with almost limitless potential for personalization and interactivity including a built-in gaming platform for added fun. For ages ten and up with a MSRP $149.99 USD. 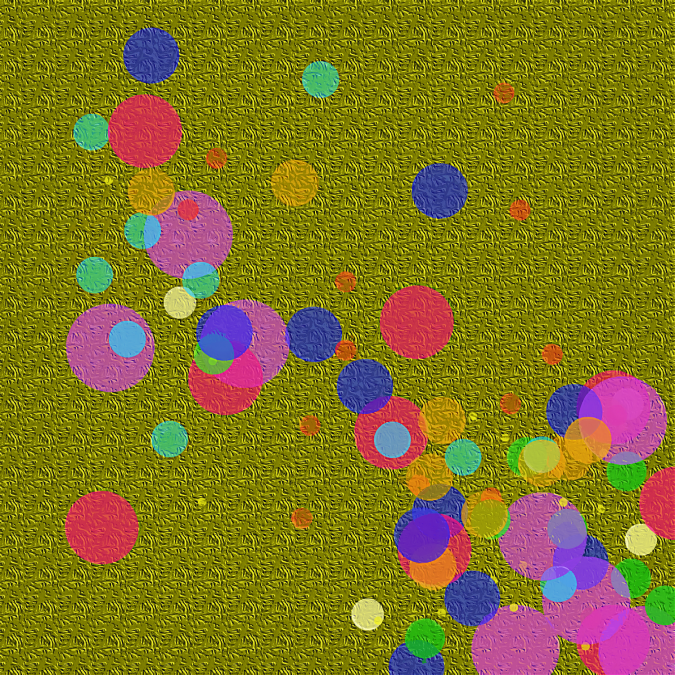 “Rainbow Unicorn Blood Splatter” is entry number three in “abstract month” here at Monday Morning Art in PopCult. Click the image to take a bigger look at just what the hell it’s supposed to be. It’s an abstract, so there are no wrong answers, just pointless questions. As day two of the 2017 International Toy Fair in New York begins, we’re going to post another batch of links toother websties covering the event in person. These are more general and should have way more photos. ITM brings us tons of photos from Diamond Select’s offerings, including The Muppets, Ghostbusters, Back To The Future, DC Comics, Marvel, Pirates of the Caribbean and more. The Nerdist plans to update this post all weekend long with their picks of the most impressive toys they’ve seen. 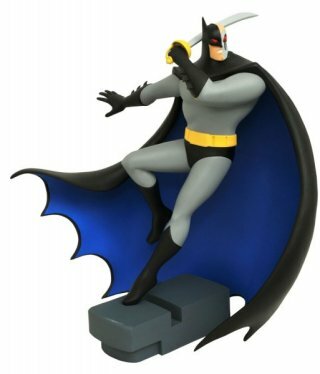 Of particular note is their confirmation that Funko will begin production of a line of Batman ’66 standard action figures. ComingSoon.net & SuperHeroHype attended Hasbro’s 2017 Entertainment Brand Preview at the New York Toy Fair this weekend, and came away with a gallery of over 85 images of products from the Marvel, Star Wars and Transformers toy lines. Check out their Hasbro Toy Fair gallery. 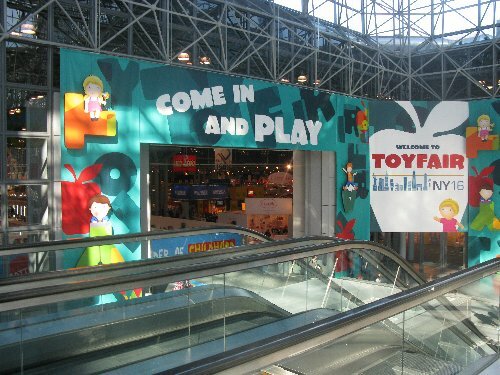 Over at KOTAKU, Mike Fahey has posted a cool batch of photos that he took on day one of Toy Fair. Bloody Disgusting has great photos of NECA’s upcoming Batman and Superman vs. Predators and Aliens collection. Finally, The TOYARK has been extensively covering Toy Fair all week long, and you’ll find a comprehensive guide to their photo-heavy news stories right HERE. Be warned that they do an amazing job and it’ll take you hours to dig through everything. This is where you’ll find the latest images from Funko’s new Planet of the Apes, Masters of the Universe and Batman ’66 lines, as well as ton of other cool things from all the major toymakers. We swiped the image below from The TOYARK, just to give you a hint. More Toy Fair news is coming your way in PopCult. Keep checking back. Once again this week we’re going to look at videos from last year’s International Toy Fair in New York City. Your PopCulteer had to skip the big show this year because he’s being sent to Morgantown for medical testing. We are covering as much of Toy Fair as we can, remotely. Below you see our clips from last year for Hot Wheels, Lionel’s Mega Tracks and Bif Bam Pow! 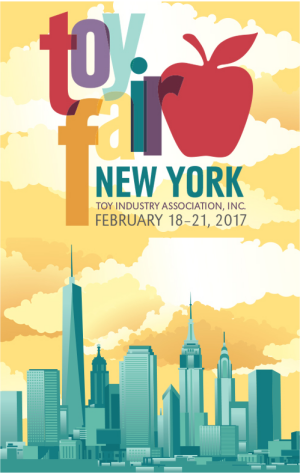 You know the drill, PopCult could not attend The International Toy Fair in New York, which is going on NOW. To help keep you up to date, here are links to some of folks who were lucky enough to attend. Dread Central has notes on Bif Bang Pow’s line of Twin Peaks Collectibles, while The Nerdist shows off Funko’s line of Twin Peaks action figures and Pop Vinyls. 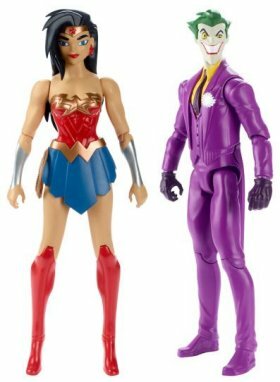 Comics Alliance has the latest on DC Collectibles slate of comic-book-store releases due out this year. .Comicbook.com looks at Mattel’s upcoming Wonder Woman action dolls. Mashable raves about the R/C Batmobile from the upcoming Justice League movie. The Nerdist presents a detailed look at NECA’s Superman vs. Muhammad Ali 7″ figure set. Newsarama presents us with even more photos and details on what to expect from DC Collectibles. 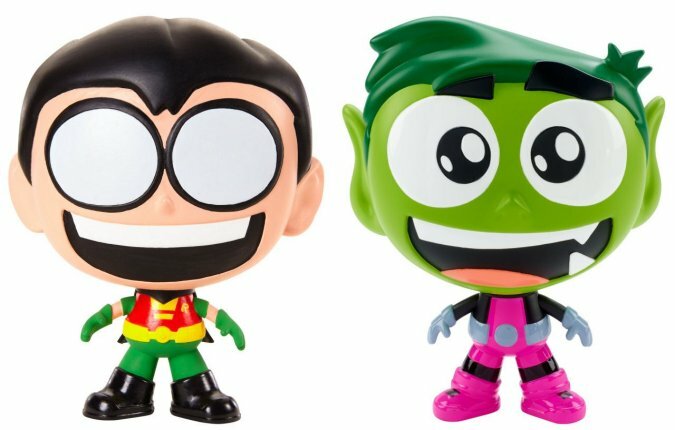 Yahoo Movies shares images of Mattel’s 12″ Justice League Action 12″ figures (most of which are in stores now) along with new additions to the DC Superhero Girls line and new Teen Titans Go! figures that apparently pass wind. You[ll also find news on The Fast and The Furious and Marvel Comics Hot Wheels. 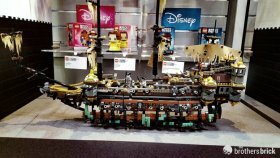 The Brothers Brick show photos of the new LEGO sets based on the upcoming fifth installment of Disney’s pirate franchise (we swiped one, seen right). There will also be Pirates of the caribbean toys coming from Spin Master, Diamond Select and more. Keep checking PopCult for more details. 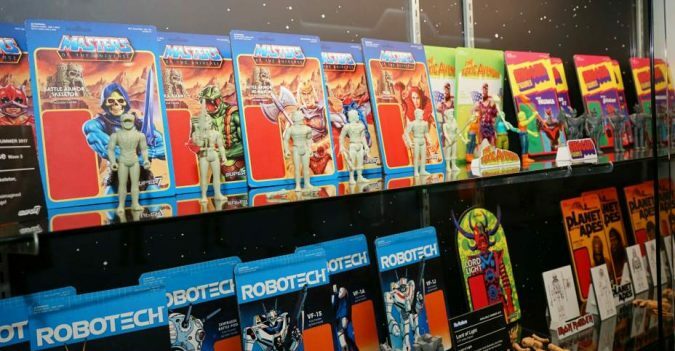 Cnet has a comprehensive photo essay showing off all the latest offerings from Mattel and Hasbro.This one hurts a bit to share, because your PopCulteer was invited to the same early media events and couldn’t go. Still, killer pictures by Sarah Tew for cnet. We’re showing you a couple, with Marvel Legends at right and Transformers below. Follow that link to see them all. Check PopCult all weekend for more news and links about Toy Fair. Also on the this episode is an installment of “The Android Family,” and part four of Frank Panucci’s series of enlightening animation, this episode is called “Porky Bang.” Host segments were shot at LiveMix Studio’s Quarrier Street home. You can read the orignal production notes HERE, but remember, many of the links are deader than crap. Hasbro unleashes the world’s largest Decepticon this weekend at Toy Fair in New York. The TRANSFORMERS battle explodes into uncharted territory when the TITANS RETURN! To control an ancient race of giant, city-sized warriors—TITANS—the AUTOBOTS and DECEPTICONS must harness the power of TITAN MASTERS, smaller bots that give bigger bots enhanced abilities in battle. The ultimate Decepticon weapon is joining the Titans Return battle! Trypticon will destroy everything and devour everyone in his path. 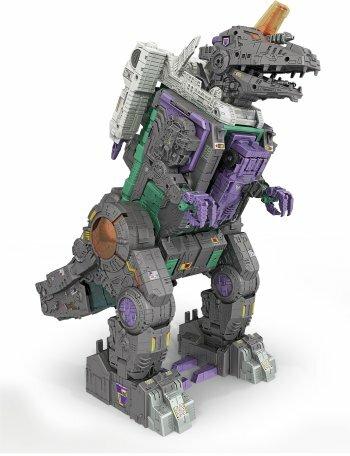 The Titan Class Trypticon figure is the largest figure in the 2017 Titans Return universe and is also the biggest Decepticon figure ever made. The towering T-Rex converts between 3 different modes: dino, spaceship (seen above), and city (seen left). When the figure is in city mode, it connects to Titans Return Leader Class figures (each sold separately) to form the giant Nemesis Command. When the figure is in T-Rex mode, it can “eat” Titan Master figures: Trypticon can chomp them down, then you can open his stomach to get them out. 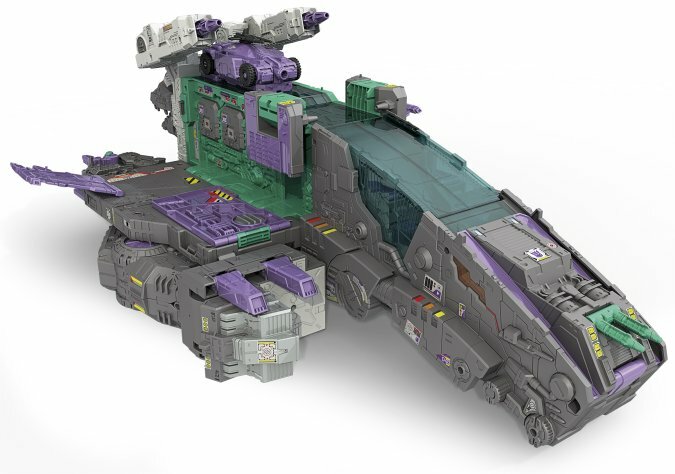 Comes with a Deluxe Class Full-Tilt figure and a Titan Master Decepticon Necro figure. 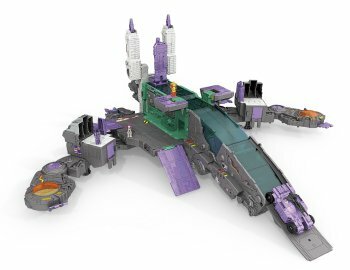 Additional Titan Master figures are each sold separately, but with so many to collect, the Titans Return battlefield is a veritable all-you-can-eat bot buffet for Trypticon. Full-Tilt figure attaches to the Trypticon figure’s chest. Titan Master figure becomes the head for the Full-Tilt figure and works with all Titans Return Deluxe, Voyager, and Leader Class figures (each sold separately). Also features a storage compartment in the figure’s tail. 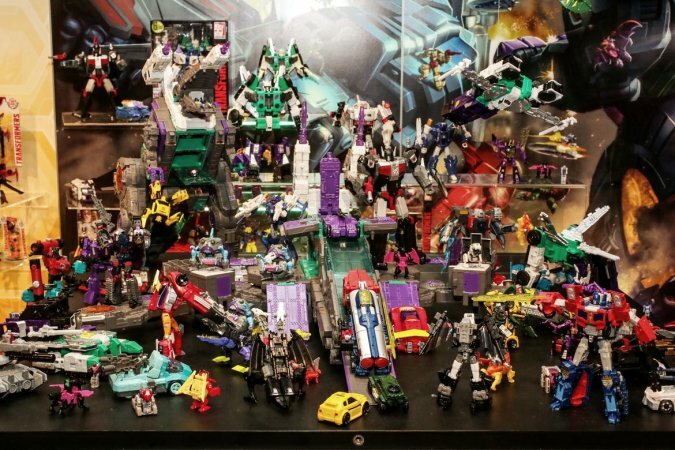 In 2015 Hasbro gave fans the option to vote for their favorite character to become the next Generations Titans Return Titan Class toy. The ballots were counted and fans voted on TRYPTICON. Coming in the fall, the TRYPTICON figure is the largest figure in the 2017 Titans Return universe and is also the biggest Decepticon figure ever made. It converts between three different modes: dino, spaceship and city. Transformers don’t get more impressive than this behemoth. 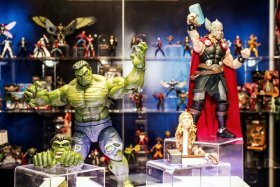 In this post we’re going to look at some of the cool new action figures and toys that are going to be officially unveiled this weekend at The International Toy Fair in New York. These are some of the biggies with huge collector followings. The two most-anticipated TWD Color Tops figures are Carl, due out any week now, and Negan, who will show up late this summer. Carl (seen left) features a spectacular likeness of Carl Grimes sculpted from images of the actor Chandler Riggs. The figure features a bandaged head and is sculpted in his outfit from Season 6 of AMC’s The Walking Dead. 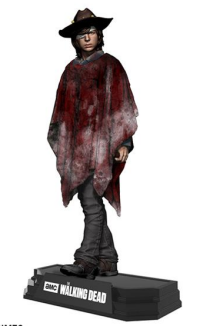 In addition to that, this figure includes an alternate gunshot wound head, removable bloody poncho and removable hat. It’s a 7″ figure complete with multiple articulation points and a stylized brand specific display base. 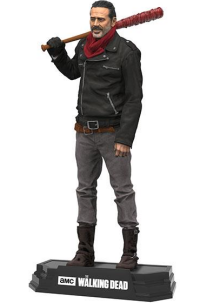 The Negan figure (seen above) will feature a stunning likeness of the actor Jeffery Dean Morgan and is sculpted in his iconic outfit from Season 7 of AMC’s The Walking Dead. Negan has over 14 points of articulation and includes a scaled version of “Lucille”, his barbed-wire baseball bat, as well as a stylized display base. Like all other figures in the Color Tops Collector lineup, Negan is packed in a numbered window box package that is perfect for display in your collection. As you know if you’ve been reading PopCult this week, I will not be able to attend The International Toy Fair in New York like I have for the past two years. The big show kicks off tomorrow, and I’m going to do my best to cover it from right here in West Virginia. All weekend long I’ll be bringing you the latest news as it leaks out, and today I’m going to post several long reports filled with all of the last-minute pre-Toy Fair scoops that I can gather. Don’t expect anything resembling a rational organization of topics. This is an avalanche. So sit back and keep hitting “Refresh,” it’s going to be a heavy weekend at PopCult. Normally I don’t cover tech toys in PopCult. I am not at all well-versed in the ways of smartphone technology, and toys that require phones or tablets just don’t seem like toys to me. However, that’s largely because I’m old. HOLO CUBE, from Merge VR, is so cool that it even impressed me. Merge VR is a very popular headset that allows people to turn their smartphones into virtual reality devices. It was an instant success last year when it hit the market, and now they’ve developed an augmented reality toy that goes with it. The world’s first holographic toy, HOLO CUBE uses augmented reality (AR) technology so users can hold and interact with holograms in new ways. 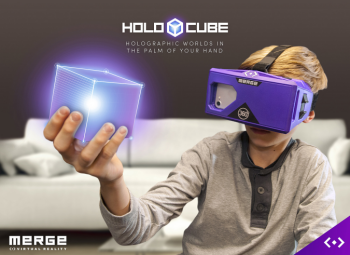 Merge introduced HOLO CUBE at CES and showed how they bring the cube to life in users’ hands — from drawing with music to caring for a virtual space pet to building a mini-block world. Pairing HOLO CUBE with the company’s marshmallow-soft Merge VR Goggles lets users interact directly with holograms while freeing both hands for a fully immersive experience. Merge also unveiled several new colors of its Merge VR Goggles at CES, and will be showing them at Toy Fair this weekend. In addition to the signature purple, they were made available in new colors beginning January 4, 2017 on the company’s website.